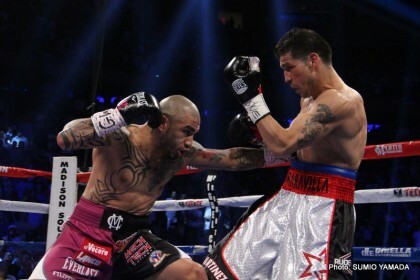 Tonight at 9PM EST/6PM PST, “JEK III Productions” presents a special “WBC/Ring Middleweight Champion Miguel Cotto” edition of “The Pugilist KOrner’s: Weekend Wrap”!! Throughout the first forty minutes of tonight’s program, James and Joseph will discuss Miguel Cotto‘s brilliant stoppage victory over former lineal Middleweight champion Sergio “Maravilla“ Martinez in ten rounds, which took place last night at the Madison Square Garden Arena in NYC, New York, in front of over 20,000 fight fans. The Pugilist KOrner team will also talk about the Caguas native’s future in the sport of boxing, as well as potential opposition in the Super Middleweight and Middleweight divisions. The PK crew will also examine this Saturday night‘s double header from Barclays Center in Brooklyn, New York, featuring Ruslan Provodnikov and Demetrius Andrade. At the forty minute mark of the show, “The Pugilist KOrner’s: Weekend Wrap” is honored to feature elite level trainer Ronnie Shields. The Plex Gym fight coach will discuss last night‘s main event from MSG, and assess Cotto‘s stunning performance over “Maravilla“ Martinez. Coach Shields will also discuss potential bouts between the newly crowned 160 pound title holder and Triple G, Erislandy Lara, Canelo Alvarez, and Floyd Mayweather Jr. In the final segment of the evening, at the 80 minute mark, we’re proud to feature master strategist James Gogue on “The Pugilist KOrner‘s: Weekend Wrap”. The three decade boxing coach will breakdown this Saturday night‘s main event between Ruslan Provodnikov and Chris Algieri, as well as a potential meeting between Cotto and Canelo. “The Gogue” will also talk about the Golden Boy quandary and their future as the promotional leader in boxing. Previous boxing news: Mayweather/Pacquiao: Will It Ever Happen?